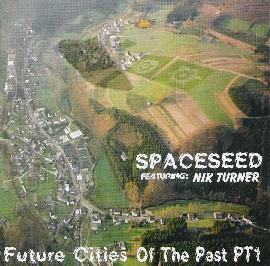 Spaceseed - "Future Cities of the Past Pt. 1"
Though Spaceseed has been around in one form or another for over a decade, Future Cities of the Past, Pt.1 is the group's first full-length release. Joined by Hawkwind alumnus Nik Turner, the Spaceseed crew features John Pack (guitars, vocals), Gal Axy (keyboards, sound generators, space simulations), The Subliminator (vocals, vocal processors) and Grant Dawson (drums, keyboards, bass). With the Thunder Rider's invaluable assistance, there's no denying the enormous debt the group owes Hawkwind. However, it's clear that Spaceseed is intent on forging its own distinct identity apart from their legendary sire. The album's opening track "Mojo," though firmly tethered to earth by a motorized bass line and Turner's driving, phase-shifted sax, nevertheless rockets into the void like a Saturn-5 trailing jets of flame and fragments of free-falling metal. Gal Axy detonates a mine field of molten synth debris over which Pack's cobalt-tipped space axe explodes with all the fury of a supernova. "The Heat Worshipping Space Zombies" takes the sonic-overload aesthetic of "Mojo" to the outer limits of G-force endurance. Built around a bone-crushing guitar riff-a primeval descendant of Blue Oyster Cult's "Godzilla"-"The Heat Worshipping Space Zombies" spirals downward into a seething maelstrom of spinning synthesizers, Rob Zombie-inspired manic/comic vocals, and searing lead runs by Pack. Turner's oddly mellifluous extended sax solo serves to anchor the listener in the calmer region at the eye of this relentless storm. "Nessie" features a dynamic instrumental arrangement with a vacuum of imploding synth effects and crunchy guitar that mutates into an aqueous vortex of electronic alchemy. Dawson's deft fusion of acoustic and electronic drumming is especially impressive here and solidifies his reputation as a cyborg drummer to be reckoned with. The brief but soaring "Pictographs" creates an almost hypnotic soundtrack to a futuristic documentary on Paleolithic cinematography and seamlessly glides into the album's closing track, "Alchemy." Essentially a pretext for a spoken word chant 'n' rant by Turner, Gal Axy's cool, muted synth textures underscore the hip jazz arrangement over which some very slink sax (courtesy of you-know-who) echoes out into the infinite spaces of tomorrow's blighted wasteland. If there's any complaint to be made about Future Cities, it's that the brief instrumental pastiches that link many of the songs are underdeveloped and interrupt rather than enhance the otherwise potent cosmic assault delivered by the album's best tracks. As a whole, though, Future Cities is a thoroughly satisfying, if at times diffuse, mixture of early 80s Hawkwind supercharged with some of the monster metal excesses of White Zombie. Aficionados of space rock, sci-fi "B" movies and inter-cranial sonic destruction will definitely want to listen to this first full flowering of Spaceseed. For more information you visit the Spaceseed web site at: http://www.spaceseed.org. Visit the Nik Turner web site at: http://www.nikturner.com.